This lighting hours tool is provided free of charge. 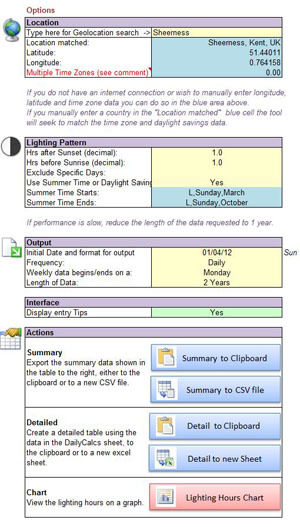 This spreadsheet is designed to provide the number of lighting hours – i.e. night-time hours – in a day, week or month, which will vary according to the season. With this data it is possible to assess the energy consumption used for exterior or street lighting. It contains routines from the US National Oceanic and Atmospheric Administration, adapted for Excel by Greg Pelletier. Additional routines for Geolocation searching using Google Maps have been taken from Jamie Bull at oCoCarbon. To use the tool simply enter a location in the search cell (if you have an internet connection – otherwise provide latitude and longitude data). You can define the lighting pattern and then define the precise output that meets your needs. Sunrise and sunset times are provided and in order to determine these the tool will take into account Time Zone and Daylight Savings dates for many countries. The workbook also contains a sheet describing how lighting data can be used to interpret energy consumption, which those new to energy management may find useful. The current release is version 1.3. Routines to handle perpetual day and night situations. This is an Excel 2003 “.xls” file, which has been tested on Excel 2003, Excel 2010, Excel 2016 and Excel 2019. All Visual Basic code is accessible and suggestions for improvement are warmly welcome. In order to notify those who wish to receive update information you will be asked to provide your email address prior to uploading this file. Please note that this file is provided “as is” and no warranty is made as to the accuracy of the output or as to any consequences arising from using the file. 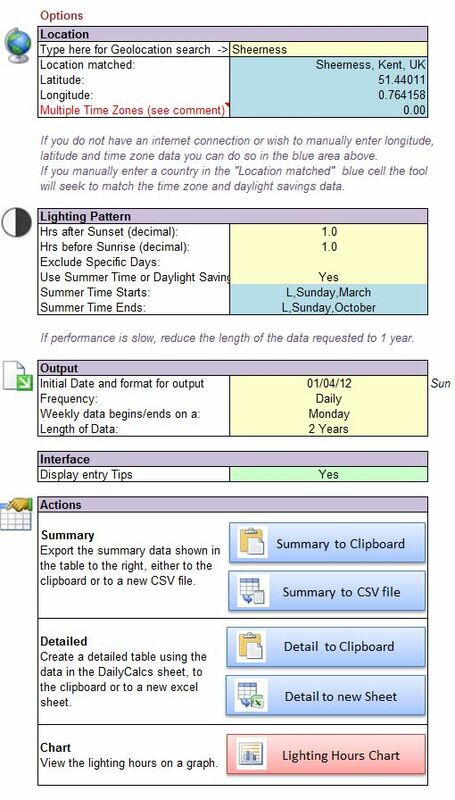 Please also be aware that while this spreadsheet can calculate lighting hours related to sunrise and sunset, additional lighting requirements that may arise from cloud or other weather phenomena are not estimated. Why not check out other Excel tools from SustainSuccess. Learn about our Services in Energy Efficiency, Sustainability and Cost Reduction. 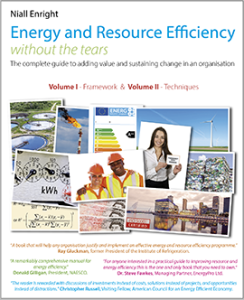 Or read some articles and blogs about why Resource Efficiency is not Easy! Or see my reviews of some great books. To deliver outstanding results for customers and support best practices in our profession. Niall Enright’s book was published in June 2017 and last updated in September 2018. To get the FREE PDF visit the download page. To buy a print version of the book or order the companion files please visit our store. If you appreciate the book and want to make a donation towards the publication costs (and support future publications), click the link below. This is entirely optional! We were so frustrated at SustainSuccess with trying to find daylight hour tables for client locations that we wrote our own Excel/Google Maps/NOAA “mashup” to calculate lighting hours for any location on Earth! We are providing it FREE to fellow practitioners. Simply fill in this form and we’ll send you a download link. Despite self-congratulatory case studies to the contrary, the reality is that Sustainability and Resource Efficiency are NOT EASY to implement successfully in organisations. In a series of blogs, articles, book reviews, and extracts from Niall Enright's book you will find hints, tips and suggestions to make Sustainability a Success. Enter your email address below and you will be notified when there are new posts and articles. You can unsubscribe at any time through a link on the emails. To send me an email, simply click here, or complete the contact form. 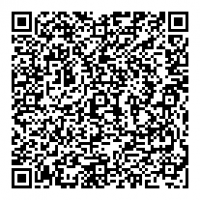 For full contact details in internet format vCard click here or scan the QR code below. Capability and Motivation – why you need both to achieve change. Here are some of my favourite energy and resource efficiency sites (mouse over the names for more details).